We recently re-published an article on fitness standards within the first responder community. Once again, we received lots of comments/feedback from the MTI Community which we wanted to share with you. If you too have thoughts, comments or questions on this matter, email us at coach@mtntactical.com. 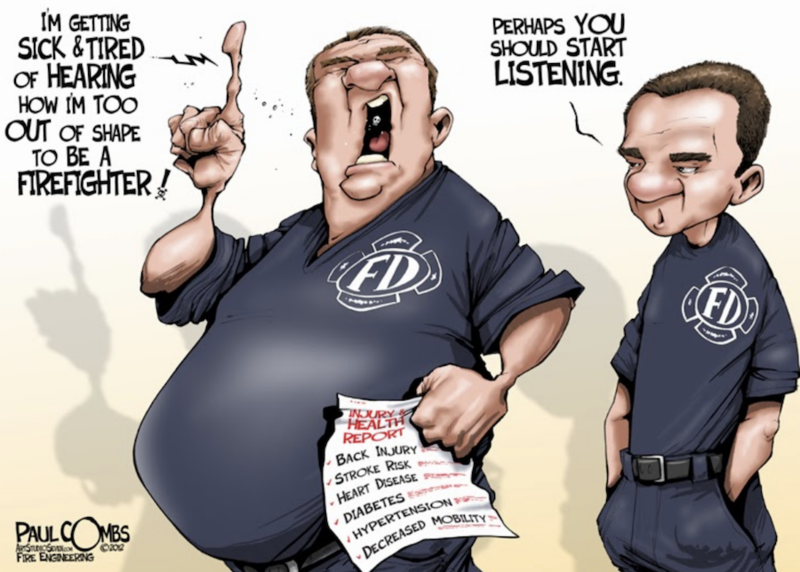 Orginal Article → First Responders: Why Do You Tolerate Unfit Police and Firefighters? I believe it was the old country singer Porter Wagoner who had a song called, “The cold hard facts of life.” Amazing perspective on this topic. I am a police academy instructor. There are 6 full time staff and I am blessed to work with a great crew. However, we are deeply divided in the area of fitness. The 3 masters degree guys pretty much wont even walk through the gym much less work out. The other 3 of us “knuckle draggers” work out with the students with the lead PT instructor having a CrossFit instructor rating. We follow Cooper protocol for entry and exit recruit testing. I really feel a burden to set an example for the younger and older guys in training. I’m almost 52 and pretty stocky but can keep up with most of the kids. I wish there was a way to motivate them to get back in the gym. I have even had recruits ask why the other 3 don’t work out with them so obviously they are seeing it as an issue. I wish only the best for my brother instructors but would love any insight into a solution you can offer. I’m guessing their issue may be ego-based in part. Nobody likes to look bad in the gym or on the range. Another interesting aspect of our work is the number of 20-something’s who show up to the academy unable to do more than a couple of pushups or sit-ups. It’s a battle on all fronts!! Sorry for rambling but this struck a chord. Love your work, stay the course! Unfortunately sometimes you don’t have a choice but to tolerate them. If you tell them they’re unfit and need to do something about it they will file a harassment complaint. It’s more likely to cost you your job than to make them change. It’s such an officer safety issue!! You need to be fit and strong to stay safe and keep others safe! Because they’re too busy worrying about cops with tattoos to be concerned about fitness. Culture. The culture still accepts it. But I think tides are turning. If you look at the spread of causes for LODDs in firefighting it’s arguable that you should spend more time working out and less time doing RIT yet find me a Chief Officer with the fortitude to stand behind that statement. They’re few and far between. Sadly it’s getting harder and harder to ignore the facts. It’s in the military too. Yes there are height and weight standards and PT tests but they’re a joke. If you’re military, or first responders of any kind (police/fire/ems) you need to be a prime example of a human being. Best of the best and hold yourself to the highest standards. No exceptions. I think it’s a cultural thing. You either have the drive to stay fit or you don’t. When I tore my Achilles, I got out of shape because I couldn’t run anymore… also got depressed a bit. It felt wrong to me, though, because I’ve always kept myself in shape. All it took for me was to glance in the mirror and see the number on the scale and I set my alarm for an hour earlier… I’m still doing PT for the Achilles, but I’m hitting a good 40 minutes of cardio every day. I’m still nowhere near where I want to be, but I’m never going to be as bad as I was. My department has no standard. So you can’t discipline anyone for poor fitness. To change the policy requires the state legislation to change a law.. So…. We have no standard. I am in charge of the fitness committee at my Job. We use to have the pack standard for our arduous testing for red cards annually. That has changed over the years due to injuries during the test. Cal Fire is not the only organization that does not have a standard. When I tried to implement a standard/change it gets very complicated due to employees rights and one of the biggest hurdles is ourselves and the Union standard/lack of standards. In North America we have decided that everyone is to be tolerated at all times and no one’s feelings are ever to be hurt under any circumstances. Inclusion is more important than performance. Tell someone at work they are out of shape? The sky would fall. And then you’d be up to your eyeballs in harassment complaints, conflict resolution meetings and sensitivity training. Not really excuses. If there is no standard or policy that says you HAVE to meet a fitness standard, you CAN’T fire someone. The agency, Union, and coppers/hose draggers have to get behind it and put it on PAPER. It can’t be some theoretical “you should be in good shape”. There has to be a standard! don’t see any mention of the effect of altered shift and sleep schedules, ptsd or cumulative stress which are all documented to have effect on the physical well being of first responders. This article seems to suggest that it’s simply a lack of motivation that leads to unfit members. If the organization is going to demand fitness it needs to provide opportunity ( gyms and time to use them) and it needs to account for stress and sleep issues and the hormonal effect they have on the human body.